At most of the programs I visit there is a reluctance to use preprogrammed scenarios with centers opting to run simulators on “on the fly”. While it is true that that there is an investment of time in initially creating scenarios in a preprogrammed mode, I assure you it is well worth the time. I believe you can increase the efficiency and productivity of your center, your ability to function as a facilitator, debriefer as well as run scenarios in a more reliable fashion and gather performance data. (“Reliable” in the sense of running the scenario the same way over and over.) Some people feel overly restricted when they are operating in a preprogrammed mode. People always tell me that students do unexpected things and that is the reason they can’t use preprogrammed scenarios. I will discuss this feeling is likely a result of the way the programming is performed. For the purpose of this post I will be discussing my experiences using the Laerdal SimMan Simulation platform. Improve Facilitation: Once you become accustomed to preprogrammed you will worry less about what the simulator is doing and be able to concentrate more on what the participant(s) are doing. Creating menu items allow you to click the progress of the scenario as well as realizing that these “clicks” can serve as notes for you to assist in the debriefing phase can free up a lot of attention and anxiety on the part of the facilitator. The benefits of less stressful facilitation are noted early on, when even the simplest of parameters are preprogrammed to reflect the “initial state” at the beginning of the scenario! Other aspects of facilitation can be enhanced by the use of preprogrammed scenarios as well. Integrating suggested debriefing commentary, or just listing debriefing suggestions and associating them with menu items can greatly improve the debriefing process. While I’m not suggesting that the entire debriefing can be conducted solely from comments in the simulator log file, the information that is generated by a well preprogrammed scenario can serve as a backbone to help structure the debriefing process. Further, this information is created and collated during the actual running of the scenario, so it is reflective of the actual performance that occurred during the scenario. The other added benefit is the backbone of the debriefing process can help the facilitator stay on track with the intended learning objectives of the simulation encounter as well as lessen the chance that they may miss major points associated with the intended learning or assessment goals. Lastly, it is far easier to teach new facilitators how to run existing scenarios from a pre-programmed perspective as opposed to needed to adjust the simulator on the fly. 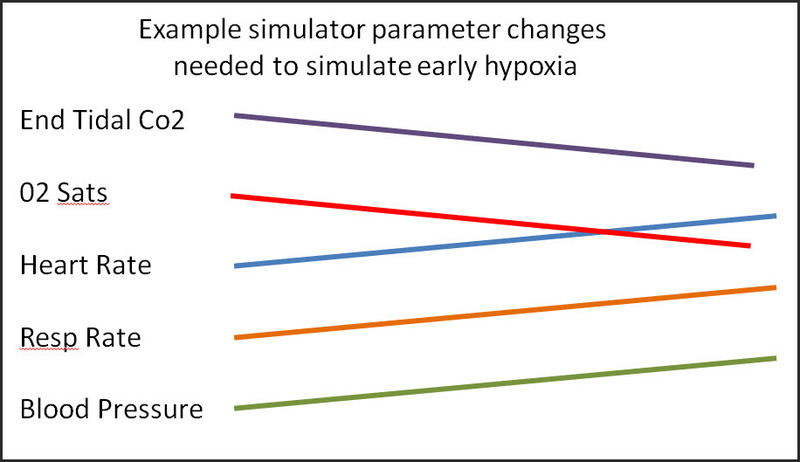 With regard to technical reliability, if you think about a simple example of hypoxia, the number of simulator parameters that need to change during the evolution of hypoxia is actually quite complicated. For example we need to elevate the heart rate, elevate the respiratory rate, decrease the saturation, transiently increase the blood pressure, decrease exhaled carbon dioxide, just to name a few. It is virtually impossible to make this number of changes manually, and do it in a fashion that is reliable, which is to say occurs in the exact same sequence and exact same timing every time the scenario runs. Addressing the programming style of the preprogrammed scenario is one of the most important aspects of success. As I mentioned previously many people feel “trapped” by the idea of running a preprogrammed scenario because often times but dispenses simulations will do unexpected things. I would argue that if your programming style reflects a sequential, expected, flow of activities and/or tasks you are much more likely to end up with this trapped in feeling, during which you assess that the simulator log file does not capture an accurate flow of the scenario as it played out. A recurring theme of my thoughts in simulation is to remember that we are NOT trying to simulate reality. We’re trying to create an environment that allows people to do things that approximates what happens when they take care of actual patient so that we can form an opinion and give them feedback and help them improve. People make it complicated during the programming of the scenario when the menu items and programmatic flow of the scenario require certain events to happen or not happen. It is important that the programming reflect the possibilities of unexpected things happening, as well as expected things not happening. So separating the idea of the electronic checklist (of items that you want to note, and/or record) and those menu items that are solely existing for the “facilitation” or the driving of the scenario in a direction that allows the educational and/or assessment goals to be accomplished. Many of the programming courses that are offered by simulation manufacturers encourage programming style that tries to create menu items that follow a scenario with an expected sequential progress. But the reality of simulating healthcare scenarios is there are many correct ways to do things, particularly when you deal with learners above the novice level. To be successful in preprogramming these we must break away from the idea that everything will occur in an orderly fashion. I strongly encourage programming style that assists the facilitator in the electronic checklist items, but also one that helps make it easy for the facilitator to drive the scenario in the proper direction. The overall center efficiency can be significantly enhanced by the use of preprogrammed scenarios insofar as automating many of the data collection activities that go on in the center. Well programmed scenarios help automate the collection of standardized data with regard to performance, the number of scenarios performed, assistance with instructor evaluations, evaluation of assessments, as well as helping to do quality assurance checks on the scenarios themselves. In summary, it is true that trying to preprogrammed scenario may seem like more work than running the scenario on the fly. However the initial investment made in a carefully thought out programming methodology can enhance facilitation, debriefing, reliability, and overall simulation program efficiencies. Let’s hope to get the attention of the simulator manufacturing community to enhance these tools and realize that it will make simulation based encounter more productive. While we need to simplify some of the operations of the simulators, we DO NOT need a dumbing down of the capabilities that enhance the instructional capabilities and resources.